We had this with breakfast and five of us had a small glass of juice. 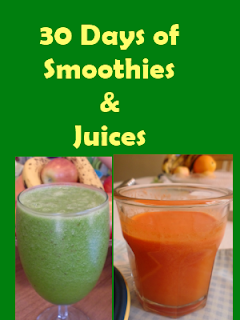 Over the next month I will be using the blender and the juicer to make a variety of fruit and vegetable concoctions. I will try and remember to take a picture and share a recipe each day from what I did. I will use some other resources some days and just experiment on other days. The goal is to just add more fruits and veggies to the diet through this medium of preparation. If you would like to join us or share a favorite smoothie or juice please feel free to leave me a comment and let me know you are joining or sharing. and other things I discover along the way.